ONE4all is made of solid wood sealed with clear varnish. The safety system is suitable for children up to 24 months of age. A practical detail: The ONE4all gate can be opened in either direction. Installed dimensions: The usable* installed length of ONE4all 1+5 as safety gate is maximum 4.85m. 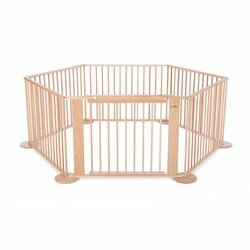 When installed as a playpen as shown, the outer dimensions are approx. 1.5m x 1.7m. Modularity/ extendibility: Since ONE4all is an integrated system, you can combine all ONE4all components with each other in any conceivable configuration. This means that later reconfiguration is "child's play". 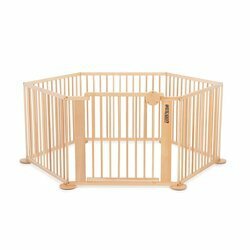 The soft mat fits perfectly into the playpens Strolch 1plus5, ONE4all 1+5 or other playpens with an edge length of 0.9m and protects your kid from cold and hard floors. Use only on plane ground. The safety fence/ parc is not foldable! The article is not foldable!